No pictures found for plate number 5BFP277 in California, United States. click here to add a picture. No videos found for plate number 5BFP277 in California, United States. click here to add a video. 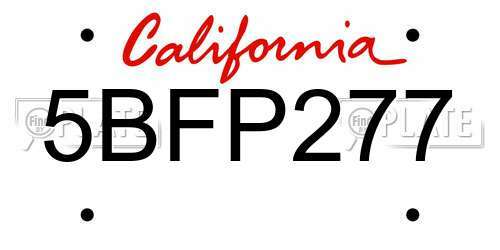 No owners found for plate number 5BFP277 in California, United States. click here to add an owner. No related websites found for plate number 5BFP277 in California, United States. click here to add a related website. FORD'S RECALL CAMPAIGN NUMBER IS 09S09.OWNERS MAY ALSO CONTACT THE NATIONAL HIGHWAY TRAFFIC SAFETY ADMINISTRATION'S VEHICLE SAFETY HOTLINE AT 1-888-327-4236 (TTY 1-800-424-9153), OR GO TO <A HREF=HTTP://WWW.SAFERCAR.GOV>HTTP://WWW.SAFERCAR.GOV</A> . FORD RECALL NO. 03S03.CUSTOMERS CAN ALSO CONTACT THE NATIONAL HIGHWAY TRAFFIC SAFETY ADMINISTRATION'S AUTO SAFETY HOTLINE AT 1-888-DASH-2-DOT (1-888-327-4236). FORD RECALL NO. 03S04.CUSTOMERS CAN ALSO CONTACT THE NATIONAL HIGHWAY TRAFFIC SAFETY ADMINISTRATION'S AUTO SAFETY HOTLINE AT 1-888-DASH-2-DOT (1-888-327-4236). THE REPLACEMENT/REIMBURSEMENT PROGRAM FOR THIS CAMPAIGN EXPIRED ON MARCH 31, 2002. HOWEVER, CUSTOMERS CAN CONTACT FORD AT 1-877-917-3673 OR GO ON-LINE TO WWW.FORD.COM FOR POSSIBLE ASSISTANCE. OWNER NOTIFICATION BEGAN JANUARY 23, 2001.OWNERS WHO TAKE THEIR VEHICLES TO AN AUTHORIZED DEALER ON AN AGREED UPON SERVICE DATE AND DO NOT RECEIVE THE FREE REMEDY WITHIN A REASONABLE TIME SHOULD CONTACT FORD AT 1-800-392-3673.ALSO CONTACT THE NATIONAL HIGHWAY TRAFFIC SAFETY ADMINISTRATION'S AUTO SAFETY HOTLINE AT 1-888-DASH-2-DOT (1-888-327-4236). VEHICLE DESCRIPTION: MULTI-PURPOSE VEHICLES EQUIPPED WITH 4.0L ENGINES AND ALL-TIME 4-WHEEL DRIVE (A4WD) POWERTRAINS. THE GENERIC ELECTRONIC MODULE (GEM) COULD EXPERIENCE A CONDITION REFERRED TO AS "LOCK-UP" IN WHICH THE GEM CONTROLLED ELECTRONIC FUNCTIONS (E.G., FRONT WINDSHIELD WIPERS, INTERIOR LIGHTS, 4X4 SYSTEM, ETC.) COULD NOT BE TURNED ON OR, IN SOME CASES IF THE FUNCTION IS ON, COULD NOT BE TURNED OFF. OWNER NOTIFICATION BEGAN APRIL 15, 2000. OWNERS WHO TAKE THEIR VEHICLES TO AN AUTHORIZED DEALER ON AN AGREED UPON SERVICE DATE AND DO NOT RECEIVE THE FREE REMEDY WITHIN A REASONABLE TIME SHOULD CONTACT FORD AT 1-800-392-3673.ALSO CONTACT THE NATIONAL HIGHWAY TRAFFIC SAFETY ADMINISTRATION'S AUTO SAFETY HOTLINE AT 1-888-DASH-2-DOT (1-888-327-4236). OWNER NOTIFICATION BEGAN JULY 14, 1999.OWNERS WHO TAKE THEIR VEHICLES TO AN AUTHORIZED DEALER ON AN AGREED UPON SERVICE DATE AND DO NOT RECEIVE THE FREE REMEDY WITHIN A REASONABLE TIME SHOULD CONTACT FORD AT 1-800-392-3673. ALSO CONTACT THE NATIONAL HIGHWAY TRAFFIC SAFETY ADMINISTRATION'S AUTO SAFETY HOTLINE AT 1-888-DASH-2-DOT (1-888-327-4236). 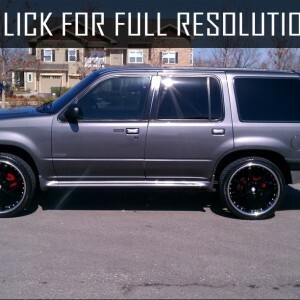 VEHICLE DESCRIPTION: SPORT UTILITY VEHICLES. THE RIGHT FRONT BRAKE LINE TO THE HYDRAULIC CONTROL UNIT (HCU) CONNECTION COULD SEPARATE CAUSING THE LINE TO LEAK WHEN THE BRAKE PEDAL IS APPLIED. OWNER NOTIFICATION BEGAN MAY 17, 1999.OWNERS WHO TAKE THEIR VEHICLES TO AN AUTHORIZED DEALER ON AN AGREED UPON SERVICE DATE AND DO NOT RECEIVE THE FREE REMEDY WITHIN A REASONABLE TIME SHOULD CONTACT FORD AT 1-800-392-3673. ALSO CONTACT THE NATIONAL HIGHWAY TRAFFIC SAFETY ADMINISTRATION'S AUTO SAFETY HOTLINE AT 1-888-DASH-2-DOT (1-888-327-4236).